Viknesh Vijayenthiran July 3, 2012 Comment Now! 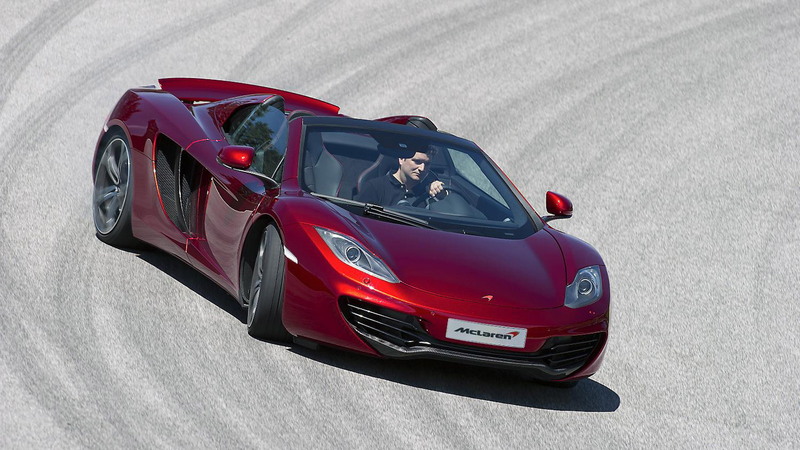 McLaren Automotive is expanding its lineup with the addition of its second model, the new 2013 McLaren MP4-12C Spider, which is ready for order and is priced from $268,250 including destination. 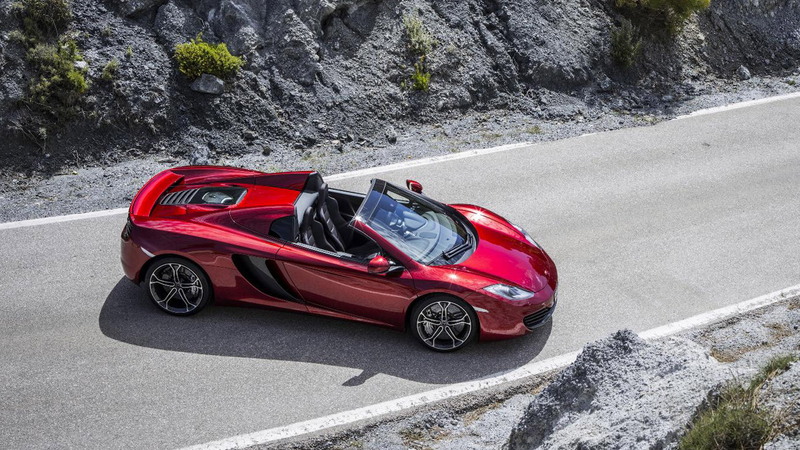 The convertible supercar comes just one year after the launch of the hard-top MP4-12C and gets all the latest features introduced with the 2013 update. This means that peak output from its twin-turbocharged 3.8-liter V-8 is a healthy 616 horsepower and 442 pound-feet of torque, which is all the more impressive when you consider the powertrain escapes a gas guzzler tax. As for the new roof system, McLaren calls the setup the ‘Retractable Hard Top’ and has designed it so that it can be operated at speeds of up to 19 mph. Raising or lowering the roof takes just 17 seconds and top speed remains an impressive 204 mph--just 3 mph shy of the hard-top’s peak. 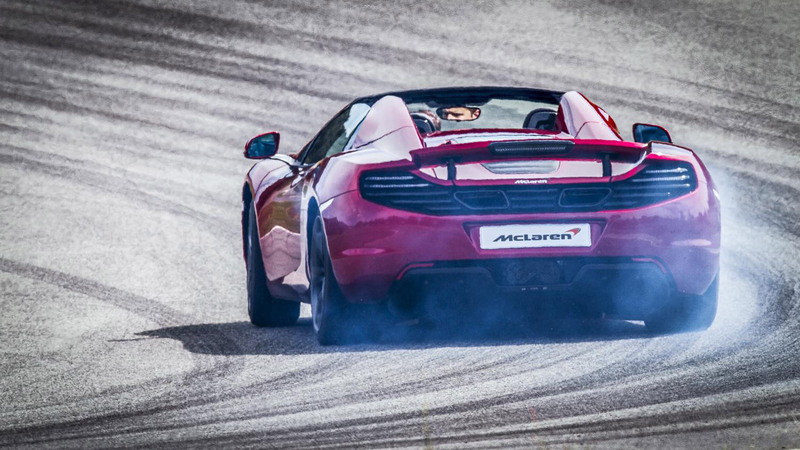 Thanks to the MP4-12C’s carbon fiber ‘MonoCell’ chassis, no additional strengthening was required for the MP4-12C Spider. The result is a sports car almost identical to its fixed roof equivalent, and weighing only 88 pounds more with the addition of a convertible option. Overall weight with all fluids on board comes in at around 3,200 pounds. 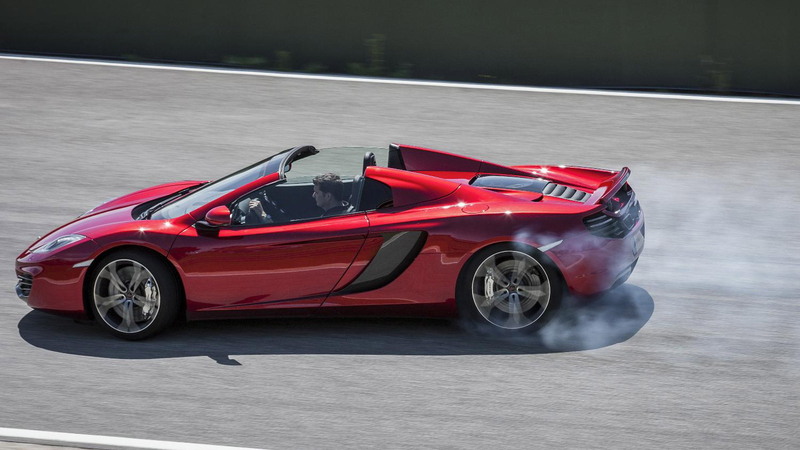 As there is no serious weight gain, performance of the MP4-12C Spider almost matches that of the hard-top. With its seven-speed dual-clutch transmission in its most potent setting, 0-60 mph acceleration takes just 3.1 seconds while the quarter mile is passed in 10.8 seconds at a speed of 134 mph. Behind the driver and passenger sits a rear windscreen which may also be electronically lowered and raised. With the roof lowered this acts as wind deflector, and with the roof raised the rear window can still be lowered, allowing the engine’s sweet exhaust note to roar into the cabin. Also with the roof raised there is around 1.8 cubic feet of storage behind the cabin. Bespoke luggage has been designed specifically to fit this space and is supplied as standard with the car. A rollover protection system is also fitted, with each of those tall buttresses containing a steel structure designed to absorb impact energy and protect occupants. Inside, the design is much the same as that found in the hard-top model. Some new features that are available across the MP4-12C range include semi-aniline perforated leather and Alcantara trim. There is also a new 19-inch wheel pattern for 2013 and vehicle lift feature. With this latter feature onboard, owners will be able to raise the ground clearance by up to 40 mm at the front and 25 mm at the rear in order to escape those bumps. The best part is that the vehicle can operate in a raised state at speeds of up to 37 mph. 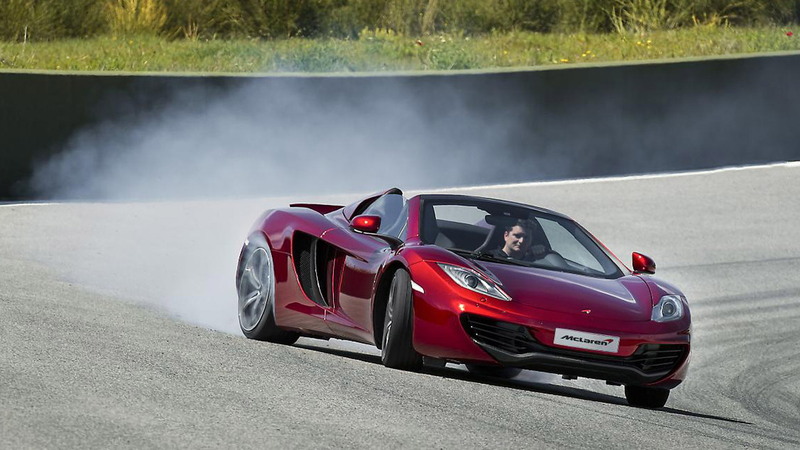 As mentioned, the 2013 McLaren MP4-12C Spider is ready for order and should commence deliveries in November. In the mealtime, head over to the McLaren website and play around with the new configurator.